How cute is this? And Pinterest-y, if we're being honest. Best yet, it cost me $3 and about half an hour. That's some Pinterest-y cuteness I can afford! 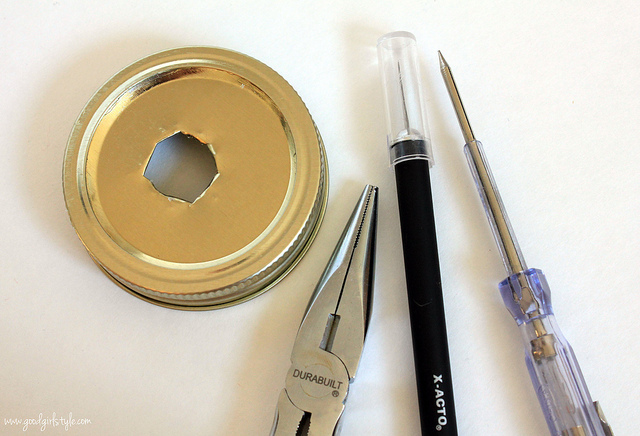 Use the X-acto knife to score an X where you want the hole to be in the flat part of the lid, then use the awl and pliers to open it up so that the thickest (top) part of the pump you chose will fit snugly. The hole doesn't have to be perfectly centered, because the rim of the pump will cover it a bit on the top. Make sure you carefully fold down the metal pieces on the underside so no one will get hurt! 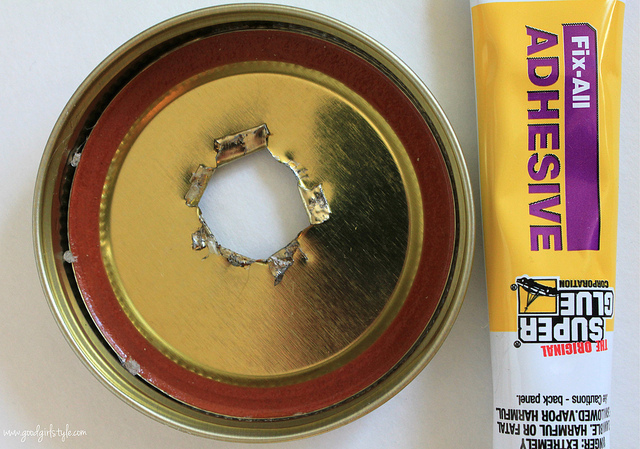 Then, line the rim of the jar band with super glue gel and push the flat lid down so the two lid pieces will become one. Let dry thoroughly. 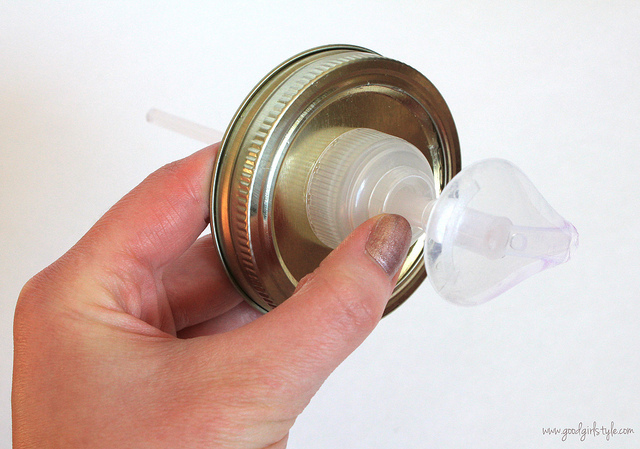 Make sure the pump fits, and hold it steady while you take a bit of super glue to secure the pump on the underside of the lid. Let dry. 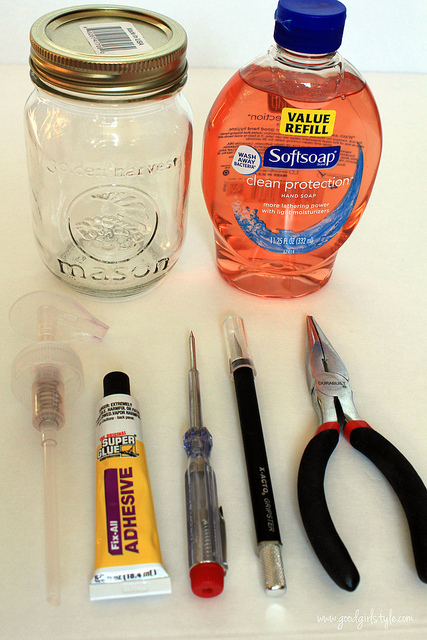 Fill your jar with soap, screw on the lid, and enjoy your handiwork! What a fun and cute idea! I never thought it was that simple! Wow I never knew this project would be so easy! Can't wait to try and and thanks for sharing!!! Awesome project, did mine this way too. Only thing I noticed is that the mason jar lid will rust after a while. A coat of spray sealer should take care of that. Thanks for posting this! This is a really cool idea. But would look better with a metal pump top. Love this! Just my style and pinning it. :) Thanks! аn hοur to reаԁ this webpagе's articles or reviews every day along with a cup of coffee. Hello to all, it's truly a good for me to go to see this web site, it includes valuable Information. I am truly thankful to the owner of this web page who has shared this impressive paragraph at at this time. 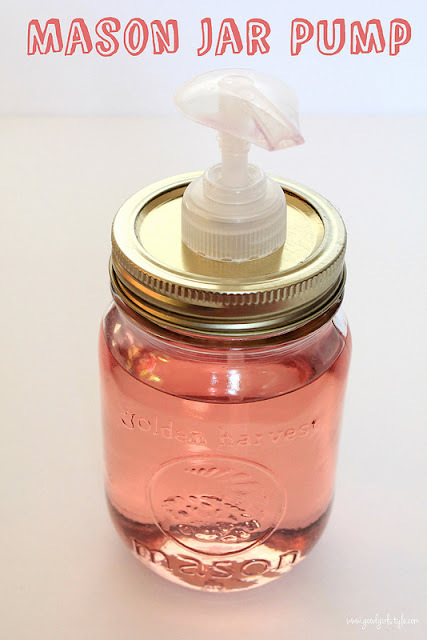 Cool ideas and that's a good place to get hand soap that's bought in the soft packs. The only thing is, the top of the jar actually looks bare. I would like to decorate it with something but have no idea what to choose first. Maybe some spray on stencils would look nice, what do you think?